The Noisy Animals are looking forward to their dream holidays and have some brilliant ideas about where in the world they want to go. Kid Carpet just wants them all to be together but will he be able to keep everyone happy when he can’t even get them in the car? 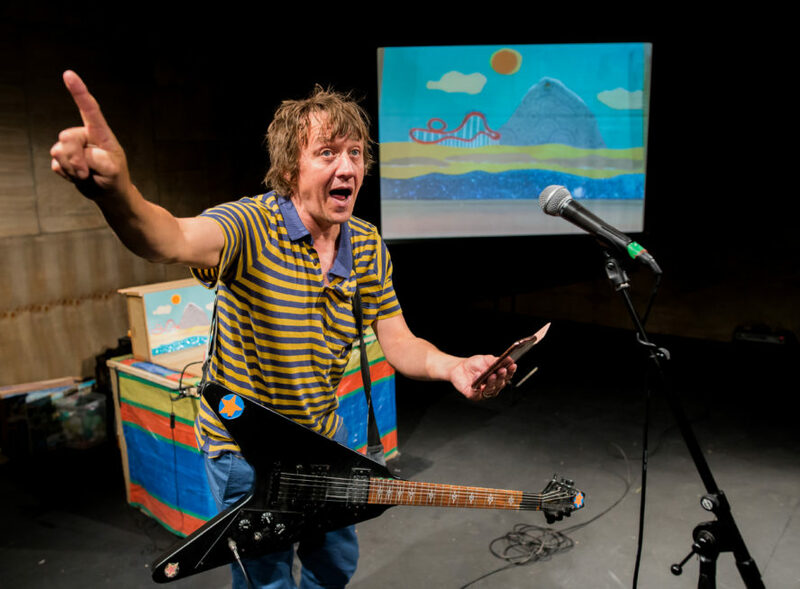 This lively mix of music, theatre, comedy, puppetry and animation includes new tracks from Kid Carpet including Rollercoaster, Swimming with the Fishes and Get in the Car. A ridiculous and funny story of going on your holidays with silliness and mischief for the whole family. Expect diving bears, massive carrots and Ibiza anthems. Ed Patrick (aka Kid Carpet), is a Bristol-based maker of nonsense music and rock’n’roll theatre. Lap seats are available at £1.50 (including booking fee) for infants aged 0 – 6 months; all patrons including infants must have a valid ticket. Ed Patrick was a normal young man who lived in Bristol and aspired to be a musician. Until he went to his local car boot sale with a ten pound note and returned with a plastic guitar, a child’s keyboard and a toy tape deck. He put his name into an online anagram generating machine and Kid Carpet was born. Kid Carpet began making music with old keyboards, toys, computers, a sellotaped up broken electric guitar and a punk rock DIY attitude. Hundreds of gigs got smashed as headline and support to acts like Art Brut, Dan le Sac vs Scroobius Pip, Electric 6, Willy Mason, Arcade Fire, The Trachtenberg Family Slideshow Players and Presidents Of The United States Of America.